Trust Rooter Rooter to Locate and Repair Your Water Line. We Specialize In Underground Leak Detection and Repair. Call Now For A Free Estimate. 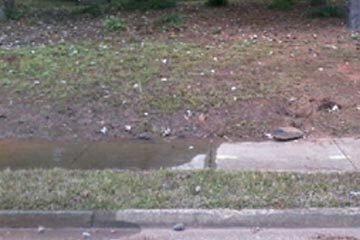 If you recently noticed water coming up from underground in your yard, you are right to be concerned. Chances are you have a water pipe leak. Has your water bill recently spiked? 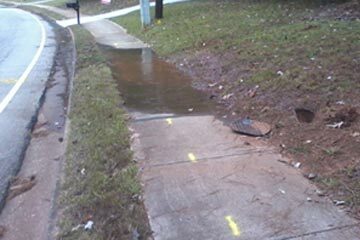 Sometimes an underground water line leak can go undetected for a while. Some obvious signs of a water line leak include high water bills, a leak in the yard, water coming up from the driveway and sinkholes. Underground slab leaks or leaks under a crawl space can also take a while before they are noticed. If you suspect a water leak, chances are you probably do. Does your home have polybutylene pipes? This type of material has been known to have many problems with breaking and leaking. There was even a class action lawsuit to help homeowners pay to replace polybutylene. Unfortunately, it's been years since that option expired. Polybutylene pipes were installed in many Georgia homes. Over the years we have repaired many homes that had polybutylene. After a homeowner notices a high water bill, they often call the water company only to find out that the homeowner is responsible for the water line going to the meter. What causes water lines to break or leak? Changing temperatures, shifting or falling soil from sinkholes, faulty installation or defective materials are just a few of the potential causes. Besides outside water leaks and underground leak, there are many types of potential water leaks in a home that should be investigated and fixed. A simple toilet leak can go through thousands of gallons. Leaky faucets, outside or inside may seem minor, but think about those drips all day and night and the gallons add up quick.